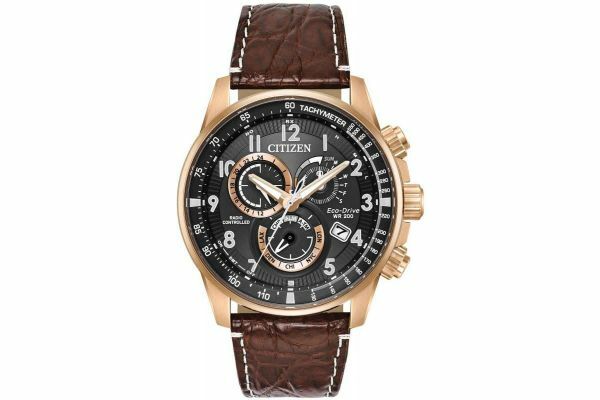 This striking special edition men’s watch is brought to you by renowned Japanese watchmakers Citizen as part of their Perpetual Chrono A-T collection. Featuring a rose gold plated stainless steel 43mm case and bezel; this remarkable watch presents with an alluring black serrated dial accentuated by rose gold highlights. This stunning dial features a further three sub-dials indicating the watches power reserve; time zones, the day of the week and a chronograph sub-dial. A small date display window is located at the 4 O’clock position. Bold numbering indicates the hours and contrasting rose gold illuminous batons further increase the readability of this arresting watch. A tachymeter indicator is found on the outer dial of the watch face. The Citizen A-T collection allows for multiple alarms to be set and also displays the time in either 12 or 24 hour formats. Set upon a dark brown genuine crocodile leather strap and fastened by a secure deployment closure; this outstanding watch is both practical and eye catching. This limited edition piece is one of only 2500 made; this watch is number 60 of the 2500. Powered by Citizens patented Eco-Drive technology; this watch will never require a battery change and is powered by solar energy. Radio Controlled; the time is set via radio waves and is adjustable at the push of a button in 5 time zones. Protected by scratch resistant Anti-Glare Sapphire glass this remarkable watch is water resistant up to 200meters and can be worn when swimming, snorkelling and showering. 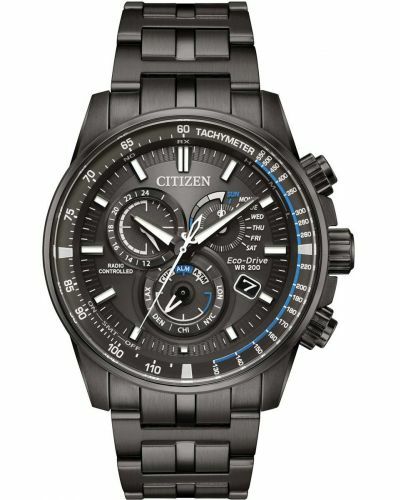 This special edition Citizen watch makes for the perfect timepiece for the suave gentleman looking for a practical watch but with a few striking twists. Complete with Citizens 5 year guarantee. For us to size your new Citizen Perpetual A-T watch as accurately as possible, please take a look at our downloadable Watch Sizing Guide.